With 2.3 million Americans behind bars, the criminal justice system is larger than ever. Its growing tentacles have caught almost every demographic subset of our country. The U.S. has less than five percent of the world’s population, yet incarcerates nearly a quarter of the world’s prisoners. The system also has massive hidden economic and societal costs that reverberate throughout society, affecting all of us. 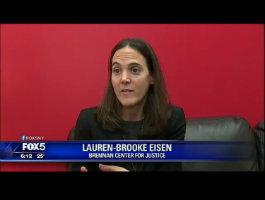 The Brennan Center seeks to reduce mass incarceration by creating a rational, effective, and fair justice system that protects public safety and communities. Our experts meld law, policy, and economics to produce high-impact empirical analyses and innovative policy solutions to advance this critical goal. To read about the program’s latest work, read the latest Justice Update e-newsletter here. Sign up to receive the Justice Update here. Presidential candidates have the opportunity to transform our criminal justice system. Here's how they could do it. This report offers state lawmakers model legislation based on smart, bold policy solutions that would keep crime low while reducing mass incarceration. It’s time for bolder action on a defining civil rights issues of our time. The Brennan Center, the Drug Policy Alliance, the National Association for the Advancement of Colored People, the Law Enforcement Action Partnership, Americans for Prosperity, FreedomWorks Foundation, the Independence Institute, Libertas Institute, the Drug Policy Forum of Hawai‘i, the Colorado Criminal Defense Bar, Alabama Appleseed Center for Law and Justice, and the Rio Grande Foundation, represented by Holwell Shuster & Goldberg LLP, filed an amicus brief in Timbs v Indiana arguing that the Eighth Amendment’s Excessive Fines Clause should be applied to the states. The Brennan Center for Justice at NYU School of Law and Cato Institute have filed an amicus brief in People v. Ali Cisse arguing that a police officer’s command to “stop!” is inherently intimidating and threatening, especially to communities of color, and should require a “founded suspicion” of criminality. This first-of-its-kind analysis provides a blueprint for how the country can drastically cut its prison population while still keeping crime rates near historic lows.